27 April 2014- SVSSS Samapan karyakram of Haryana was organised in Karnal where coming programmes of Vivekananda Kendra were told. 4 May 2014- VK Amritsar: One day Kendra Parichay karyashala was organised where 16 karyakartas attended. 14 to 18 May 2014- VK Ludhiana: 5 days Pranayama & Omkar dhyana satra was organised where 12 registered and 8 were regular. 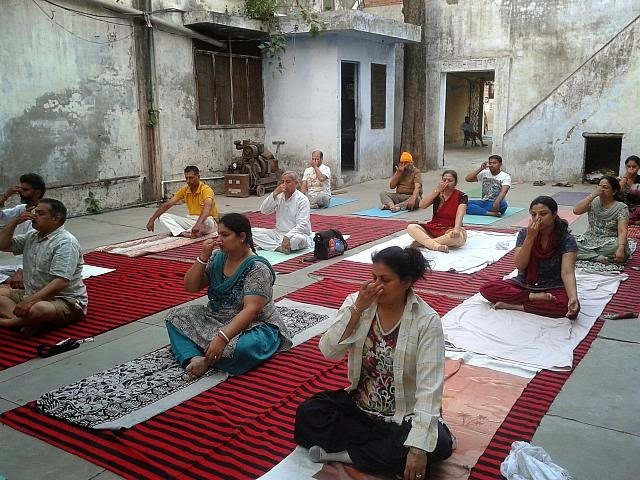 1 to 7 June 2014- VK Amritsar: Yoga Satra was organised where 15 participants registered and 13 were regular for 7 days. Every Sunday they also started yoga varg. 3 June 2014- VK Amritsar: Sanskaar Varg started in St. Sarangdhar school for interested and selected students where 50 students attend regularly. 4 to 6 June 2014- VK Amritsar: Samarth Yoga Module was organised for teachers of St. Sarangdhar School, Amritsar where 18 teachers participated. Smt. Rajni Dogra, Principal of the school & Saha Sanyojak of VK Amritsar along with Swadhyay Varg Pramukh Smt. Kanchan Bhatia conducted in a team with Prant Sangathak. 7 June 2014- In Jalandhar, the first ever meeting was organised for thinking on VK's Punjabi Prakashan Vibhag where 9 karyakartas attended out of them 3 were sisters. Shri. Rakesh Shantidoot ji will be leading the team as sahitya pramukh (MEJSP) and Smt. Shalu Khanna accepted the dayitva of saha pramukh (MEJSP). The first book taken is "The Story of Vivekanada Rock memorial" and it is now given to editorial team. Swadhyaya varg are going on at VK Amritsar 1, VK Ludhiana - 2 places, VK Rewari, VK Faridabaad, VK Panchkula.